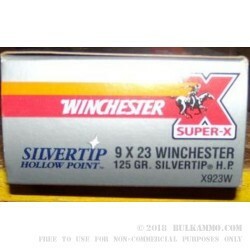 The storied past of the 9x23mm Winchester has helped to keep this otherwise quite potent round out of the mainstream. The key to the 9x23mm is the massive brass value and its increased strength relative to other brass. The web of the cartridge casing is significantly increased and the resulting ability for the cartridge to be reloaded is significant. Some people claim to have reloaded the same 9x23mm Winchester brass 20+ times. This is an incredible concept that makes this round an exceptional value even though the price point is naturally high due to low volume of production. As a factory load, this is still a potent offering, but it’s not nearly what it could be handloaded to, considering the case capabilities for standard pressure. This particular load is a 125 grain silvertip hollow point projectile with a moderate powder load and a brass casing with a Boxer primer. The round can achieve 1450 feet per second velocity and 583ft. lbs. energy at the muzzle. This makes it squarely in the 38 super/.357 Sig/10mm and even .357 Magnum range for the most part. Certainly a potent offering. The long history of use surrounding the IPSC and IDPA and USPSA competitions and the 9x23mm has made it well known, but it is still relatively low volume from a production perspective.